Stoner Kid loves weed and alcohol. 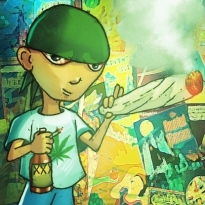 Submit your reviews of Stoner Kid to fanreviews@thehigheruniverse.com. Copyright © 2014 The Higher Universe Comics. All rights reserved.